About that DROID bootloader unlocking story. Just read the conversation above and move on with your lives. It’s locked, will always be locked, and we’re glad we used a bunch of question marks and “coulds” in our post about it. And you guys call me the hypebeast? Update: Motorola reached out to us to clear up more of this situation. They said as plain as day, “We did not send the C&D letter to Mr. Pitcock [nenolod].” They also did not receive any notice of vulnerability which nenolod claims to have sent. 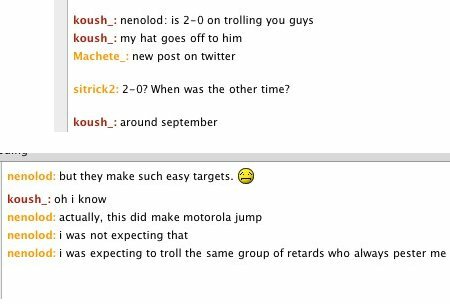 This probably isn’t surprising since the guy admitted to it being one giant scam, but Moto wanted to make sure you all knew.